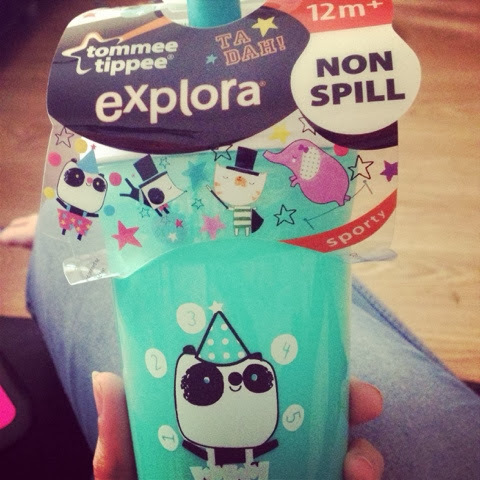 I recently posted a press release about Tommee Tippee's new range of Animal Antics cups and we were lucky enough to be sent a sample to test out. I love Tommee Tippee. I don't think there's anyone who hasn't heard of the Tommee Tippee brand. In exchange for posting the press release, I received one of the Animal Antics cups to try for myself. C is 13 months old so we received the 12mth+ cup in a gorgeous green colour with the adorable, juggling Jazz the panda on the front. I love that each bottle has their own character making drinking time more fun! 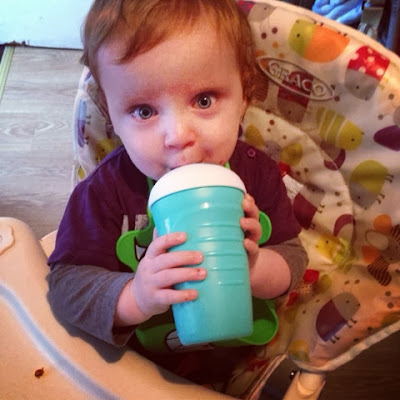 C had no trouble at all drinking from this cup. The spout is non-spill which is great because as soon as C is done drinking, he'll just throw his bottle away. Less mess for mummy! It is also nice and soft. As C normally bites down, he won't hurt his mouth. The valve is easiflow so I don't need to worry about him taking more than he can handle and then choking. The cup has a wide neck so it is very easy to clean and the panda motif hasn't washed off! In addition, these cups are dishwasher, microwave and steriliser friendly and are BPA-free. This cup can be purchased at ASDA for £3.99.